Summary: How much does a new basement cost, average basement building costs and average basement material costs and prices. For a long time in the UK we'd rather lost sight of the usefulness of basements and cellars. Many modern homes have been built without any basement at all. This was not always the case as owners of Victorian houses will know. Firstly there's the huge advantage of all that extra storage space. Secondly it helps cool the building in summer. Thirdly, it can be kitted out as a bedroom, a gym, somewhere to put the pool table, a kids' den and so on. No wonder then that basements have started to come back in fashion. And there's one more reason-it can boost the value of your home. Wait a minute, these sound like major renovations. So what's it going to take? When putting together your plan be clear in your head what it is you want. A basement conversion is the extending (in depth and area) of an existing cellar. A retrofit is the building of a brand new basement where none existed before. The first question to ask is whether your home is suitable. For example are the foundations strong enough? Are there unmoveable electric cables, water or gas pipes underneath the floor? Is your home in a region with a high underground water level, so that excavation risks flooding or damp? Once you've checked it's possible you can start planning. It's not just digging out a big hole. Spend time working out your basement needs in terms of ventilation, natural or artificial lighting, power, plumbing and insulation. You'll need surveys. Then you will need professional help. 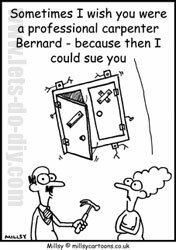 In selecting a tradesman remember to check they are properly qualified to do the job. Agree up front completion dates, payment schedules and what happens if you are not satisfied. All building work is subject to building regulations, laws put in place to enforce safety and quality. This will cover fire escapes, ventilation, insulation, electrics and plumbing. Consult your local authority and be prepared to submit an application for approval. Secondly, there are always the neighbours to consider. In terraced and semi-detached houses for instance, will the proposed work affect a shared wall? If so the law states you must have their permission. A basement conversion usually doesn't require planning permission, but a retrofit will. Again, ask your local planning department for advice. Should you live in a conservation area your property may be subject to special rules, designed to preserve the heritage of the area. Once more liaise with your local planning department. Probably the most important decision on your project is how much of the work to contract out and how much to DIY. Any jobs you do yourself will invariably be cheaper than a professional. Of course if you make mistakes, they may prove very costly to fix later on, wiping out any savings you've made. If you are not professionally qualified in a particular skill, give very careful consideration to any health and safety risks. Hospitals are crammed with DIY accident patients. No point skimping on the budget only to break a bone or worse. All building work is subject to building regulations, laws put in place to enforce safety and quality. A basement conversion usually doesn't require planning permission, but a retrofit will. If you decide to hire in qualified professionals, naturally their fees will come on top of materials and parts. The first professional through the door should be the structural engineer to perform the survey. Then there will be labourers, builders, electricians, waterproofing specialists and, depending on your plan, plasterers, plumbers and glaziers. The list of materials is a long one, it's not just bricks and mortar. Your home will need supporting with steels and props during the work. Some chunky items of equipment will need hiring, such as mechanical diggers and concrete mixers. Possibly transport too, to shift all these heavy items. The completed work will need tanking to prevent damp. (Walls above ground are damp proofed, below ground they are tanked.) Then the walls need plastering, soundproofing and insulation. Additional windows or doors may need fitting depending on the layout. The basement is going to need heat and lighting. So electric wiring will be a significant cost. Cellars usually have wiring already in place (hence the presence of the meter) but it's likely to be old. Does it need rewiring by a qualified electrician? A retrofit will need a completely new wiring job. Similarly, the cheapest option for heating is likely to be gas, so you may want to include radiators, piping and other gas equipment. Do you want the basement fitted with a toilet or washbasin? If not this is one area to make savings, but think hard about the future. Supposing you opt to change the room's use, to a granny flat for example. Don't forget to add on the legal costs of applying for planning permission and building regulation approval. The basement is going to need heat and lighting. So electric wiring will be a significant cost.